Wow! Yesterday we went to Aldi and decided to try two new products that we saw. We had never seen these at our Aldi store yet in St.Louis. WOW!! These two are amazing new finds! We picked up the cornbread crackers because they were low in calories (less than wheat), low in sugar, and low in fat! So we put back our normal Aldi wheat thins and grabbed these. Then, I noticed a honey peanut butter! So we got that. When we got home we tried them and I can't stress how good these two items are! Firstly, the cornbread crackers are going to be good to scoop ham and beans or chilli with. We also tried them with the honey peanut butter on them and it was good, and with jelly! (I love jelly on my cornbread.) These taste exactly like cornbread. Next, the Aldi honey peanut butter was amazing and tasted better than other honey peanut butters I have tried because you can really taste the honey in it right up front. It's very sweet and thick. We loved it. We decided to go back and stock up on the cornbread crackers because I haven't ever even seen cornbread crackers in other brands! Oooo! I haven't seen that Peanut Butter & Honey at our Aldi yet. I think we'd like that. I hope it comes our way!! I hope so too! Someone told me today it's a special product and once they are gone they are gone!! :( I have to get back up there and buy more to stock up. I don't want these two items to be gone! 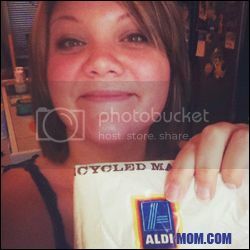 Hey, I am a manager at the Aldi in Maplewood. Heads up, those are special buy items, they only come around couple times a year and are in the advertisement. PS you can tell special buy items from regular items by the sign, special buy items have signs in red print, regular and seasonal items are in black print. I love, love, love the Aldi honey peanut butter!!! I think they are the only company that makes it. I really wish they would make it available year round! I have to believe it would be profitable. There are A LOT of peanut butter and honey lovers out there. I'm sure it would be a hit with kids, especially those who "brown bag" their school lunches.